(Release Date: August 26, 2014)  From the press release: "Based on the comic book series written by Robert Kirkman and published by Image Comics, AMC's "The Walking Dead" enjoyed its most popular season to date, averaging 13.3 million live/same-day viewers per episode and 8.6 million adults 18-49. Whether evading walkers, resisting a super flu outbreak, escaping the fall of their temporary prison haven and desperately searching for a sanctuary called Terminus, the on-going story of a group of survivors under the protective watch and leadership of Rick Grimes (Andrew Lincoln) and Dr. Hershel Greene (Scott Wilson) continues to capture viewers' imaginations on a global scale." In season four, former sheriff's deputy Rick seeks to retain peace among his ranks in the prison they have sought shelter and protection within as the walkers increase in number at the gates. Even more perilous, a mysterious flu-like virus breaks out among them. Needing to escape, they eventually take to railroad tracks that are rumored to lead to a safe zone called Terminus. Zombies continue to be almost beside the point in "The Walking Dead," the central story of people struggling to survive and hold onto their lives in a world come apart what most viewers continue to come back to. Of course, it helps to have some ugly, rotten, cannibalistic stiffs on-hand to pep things up, and season four, more so than season three, ups the horror ante and threat quotient. None of the characters are ever safe, of course, but the series takes some particularly bleak, brave, dismaying turns this year that have helped to rejuvenate what some detractors thought was an idle third season. 1.) "30 Days Without an Accident"
"The Walking Dead" is shot in 16mm, all the better to bring out the pronounced grit and gristle of its apocalyptic subject matter. The Blu-ray's 1080p transfer features a consistent layer of grain that gives palpable texture and filmic life to its visual aesthetic. Detail is strong in clothing and facial features (on the living humans as well as the grisly, effects-enhanced zombies), while backgrounds are mostly sharp but perhaps slightly softer than what 35mm or digital filmmaking might be able to produce. Colors are cool, falling on the darker, more natural side, while anomalies such as moiré, edge enhancement and banding are virtually nonexistent. This is an outstanding high-def presentation that accurately represents the filmmakers' creative intentions. The lossless Dolby TrueHD 7.1 Audio saves its biggest tricks for its riveting action sequences, the front-heavy mix rattling to hair-raising, blood-curdling life as sound effects, music and undead screams fill out the surround channels. Dialogue is always, without fail, on point. Just terrific. Audio Commentaries on six episodes with select cast and crew, including executive producer Scott M. Gimple, executive producer/special effects make-up artist/director Greg Nicotero, executive producer/unit production manager Tom Luse, director Ernest Dickerson, director Julius Ramsay, co-executive producer Denise Huth, writer Seth Hoffman, and actors Andrew Lincoln, Scott Wilson, Norman Reedus, Emily Kinney and Danai Guirra. 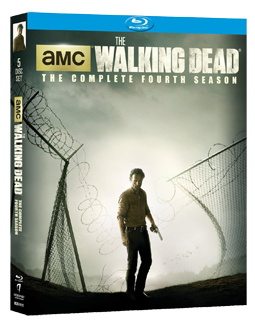 If you are a fan of the series, then Anchor Bay's Blu-ray release of "The Walking Dead: The Complete Fourth Season" should be an easy purchase. And, if you have been on the fence with the previous season, give this one a shot as the storylines and characters find their footing in a pretty substantial way. Overflowing with extensive bonus content and exceptional A/V quality, "The Walking Dead: The Complete Fourth Season" comes highly recommended.